It is Tuesday and this is a "Slice of Life" (SOLS) for Two Writing Teachers. Check out their website for lots more reflections on teaching. This is a really small slice - I am borrowing my husband's computer, because mine is being repaired. (An unfortunate accident with absolute consequences - I spilled my tea on the keyboard....) I didn't want to miss the Tuesday slice though!! We have a new ritual in the Big Cats this year - read-alouds in both English and Spanish. My Teaching Resident (Melissa) is bilingual...plus there are oh so many great picture books that are available in both English and Spanish. 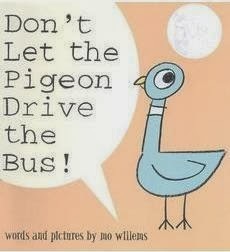 Today we read Mo Willems' Don't Let the Pigeon Drive the Bus! This is such a fun book by Mo Willems. Both Melissa and I got such a kick out of the children yelling "NO!!" every time the pigeon tried to talk them into letting him drive the bus - whether he made his demands in English or Spanish! Very, very cute! We read these familiar books with lots of dramatic flair - trying hard to mirror each others intonation, in both languages. The children are riveted by these bilingual read-alouds. SOLSC What good is the data? She is full of energy, and endless motion. She loves the sensory table. She is always busy, up to something. if not my full attention. dump it out elsewhere in the room. She is happy and non-stop. I wasn't surprised by the alphabet assessment. She didn't recognize any of the letters. She's just not ready to see these yet, I rationalized. This is a mover and a shaker. if not this preschool year, then perhaps pre-k.
At least this is what I was thinking until yesterday. opening up the paints at the easel, long after they had been closed for the day. I didn't want to say "no" anymore. "I need a minute with you - I need a hug!" while dismissing children to their families. This kept her from getting into any more mischief. she does not know any letters. What does this tell me about my assessment? What have I learned about her? How will I help her to focus from now on? What else have I missed about her? What good is the data? What about the Three Little Pigs? 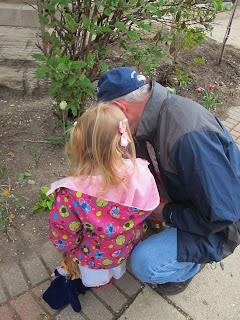 At morning gathering, the children and I were re-telling their favorite tale of The Three Little Pigs, with me pausing to ask oh so many questions - How many pigs were there? What was the first house built of? And the second house? third house? - knowing that they know this story by heart. I puzzled - "Why did they have to leave home? Why did their Mommy say it was time for them to leave?" They seemed positively surprised by this - hmmm, growing up and leaving home? The storytelling continued, with the wolf approaching the first pig's house of straw. We dramatically recited the well-known lines together, clapping feverishly on our thighs for the strong knocks of the wolf, gruffly calling out "Little Pig, Little Pig, let me come in!" and squeaking together the words "Oh, no, not by the hair of my chinny-chin-chin!" "And then the Big Bad Wolf huffs and puffs and . . . Wait. Wait. Wait. What is the problem here?" I asked. The children cried out, enthusiastically, "The wolf is going to blow his house down!" "Oh you think so? Hmmm. What if you were building the house? Could you build a house that the wolf could not blow down?" "Yes, I would stick it to the ground!" "I would have lots of bricks!" "I would not let the wolf." 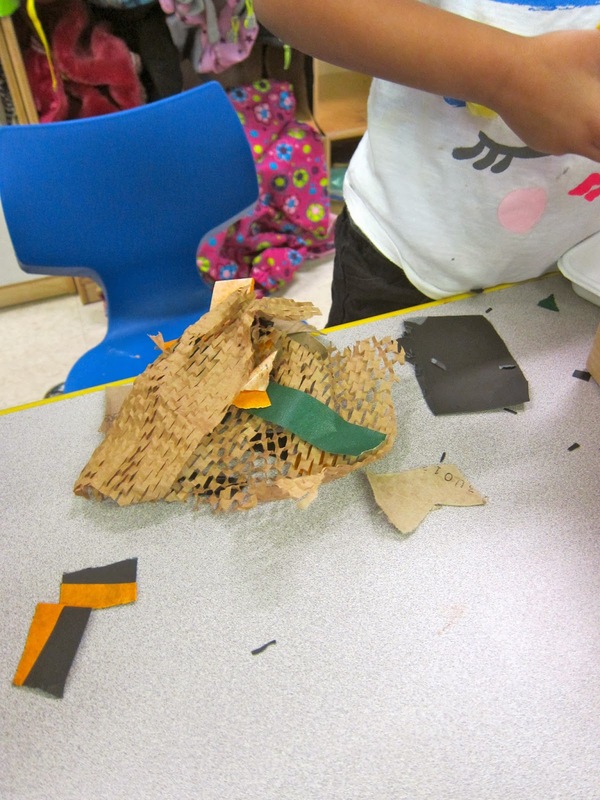 The challenge was to build a house using only ordinary household recyclables, found objects, and tape. 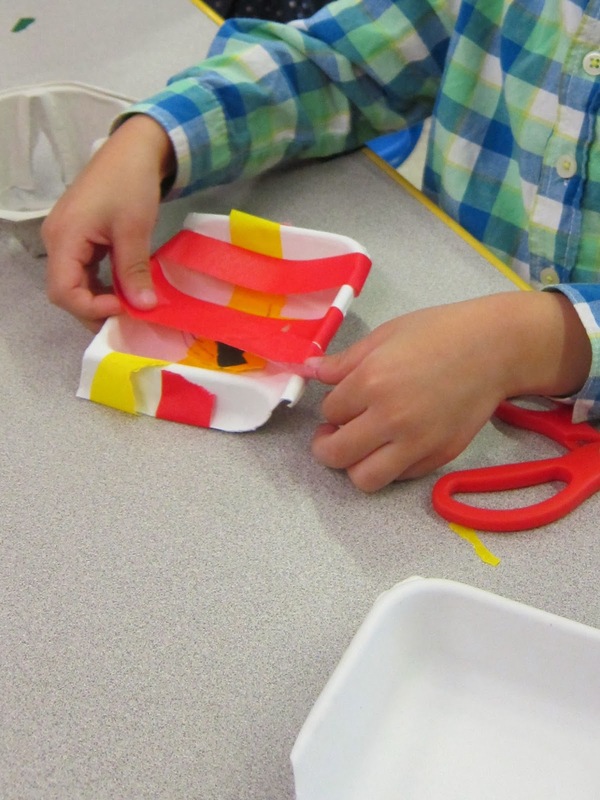 I reminded the children - engineers always test their solutions, to ensure they work. How might we test these houses? I asked. The children seemed puzzled. "We need a wolf, right? The good news is, I was able to find a wolf to come help us blow down our houses." The children looked at me surprised...and they squealed with delight when I whipped out a hair blow dryer for the test! 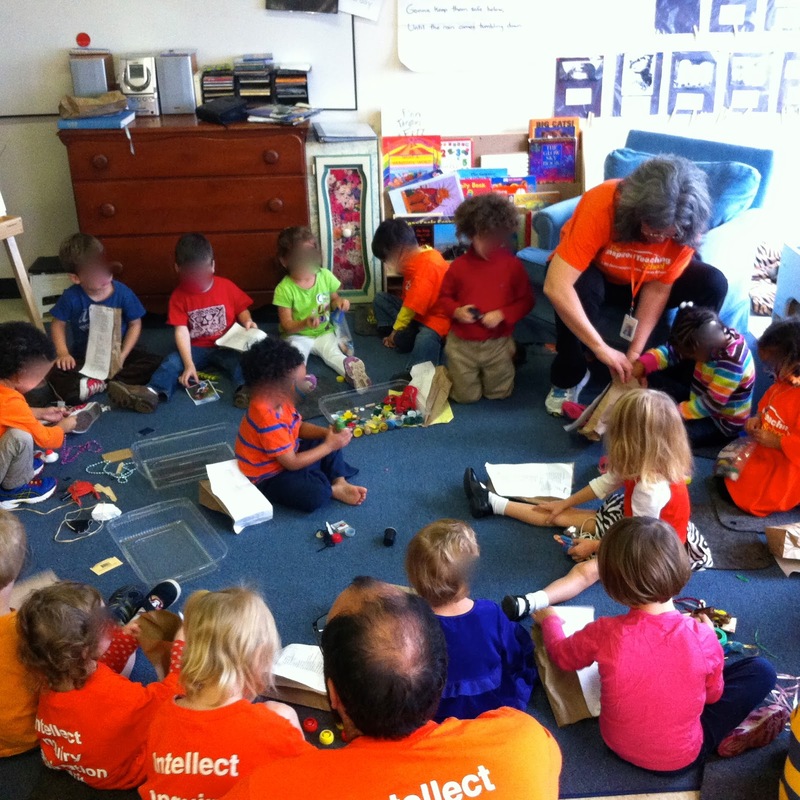 Yes, these preschoolers were hooked on today's engineering project. Can we build a house that the wolf will not blow down? I always have paper and pen at the ready and set the expectation of them creating a plan, helping them to get into the good learning habit of "first, plan, and, then, build." Honestly, here in the Big Cats (preschoolers who are three years old and newly four years old), this second and important step is often given short-shrift. Pausing to draw a diagram when one's fine motor skills are not totally there yet - many are not yet holding a pencil - seems to be an unnecessary hurdle! 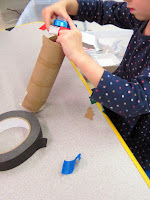 Once the children lay eyes on the bin of recyclables, their "plans" are spoken orally - shared aloud, as we choose materials to create with and excitedly get down to the work of step three - BUILDING. This is where the children are riveted. I work alongside them at the table, managing a small group of five or six children at a time. Preschoolers are still working on their scissor cutting skills, so I have prepped this table both with rolls of tape and a pair of scissors for each child plus pieces of cut tape hanging from its edges, allowing them the choice of cutting their own or taking the prepared, whichever their creative process requires. The Big Bad Wolf can't knock it over! He needs to knock on the door right here. Where is the door on your house, where does the wolf knock? How are you making your house strong? What keeps your house from blowing over? When the wolf comes and blows on it, will your house be strong? It is near impossible for me to record everything. One day soon, I will videotape this dynamic process. There is so much fun stuff going on, all at once! This is the "happy buzz" of a engaging classroom. often tongue between their lips. Finally, it is time for testing. We sit in a gathering circle, and test the houses one by one, using the blowdryer. I am amazed at the children's rapt attention at each other's work - engineering nudges them from "all about me" into open curiosity and interest about their classmates' work. We are working together! What's your prediction - will the wolf blow it over or will it stay strong? I call out, "drumroll!" and the children make a brief drumroll on their legs, as I turn on the blowdryer. Everyone is very excited. 5. SHARE ideas, consider modifications, and start again, if need be. After each test, we talk about what happened, what worked, what would change the results. Before the first test, I reminded the children - "So, if the blowdryer knocks over our house, will we burst into tears and throw ourselves on the floor in a tantrum?" Everyone laughs at my pantomine of a tantrum. "No! We will take a deep breath and say, hey, why didn't that work? 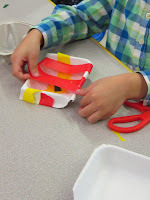 And we will ask our classmates - does anyone have any ideas how to make it stronger?" This reflective discussion by the whole group is extremely important. As I anticipated - and, as in real engineering efforts - a couple of the houses failed. When we turned on the blowdryer, they did not stand strong but, instead, blew over. What ideas do you have for making this house stronger? What might you add or change, so that it does not fall over or blow away? How does this house compare to the one we looked at before? What is the same or different? Let's share our thoughts about why one house is standing, but another has blown over? Why is that? 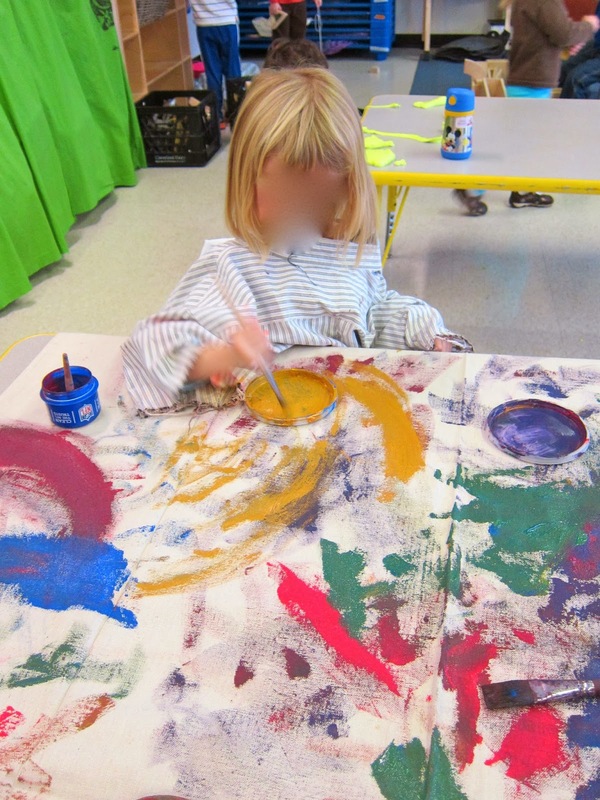 provides children the opportunity to experience 'failure' or 'less than perfect' results in a safe, playful environment. Children are driven to figure it out - to build a house that passes the test. I love seeing their different approaches to learning. Jasmine drew a very clear plan for her house, but seemed to lose sight of this for a bit. She was fascinated by some wispy packing materials in the recyclable bin - and spent some time adding tape to these, cutting and trimming. I was concerned that these would simply blow away, so I "nudged her" with the question, "I see you have found some soft materials to build with. What is your prediction, when the wolf comes to this house, will it be strong?" To which she answered, "Oh it's okay! I'm making the first little piggy's house!" Delightful. After working so successfully with Ellie, I noticed Jasmine return to her wispy house and begin working with renewed energy. She added several heavier pieces of recyclables, one recognizable as a chimney! Her wispy materials were completely covered by these stronger pieces. Yes, her house passed the test easily, standing strong against the blowdryer wolf. Check out her final project and her original plan - am I the only one who sees a similarity? She planned and constructed a solid house. curiosity, perseverance, flexibility, determination, resilience, teamwork. And a great time is had by all! We are engineers! We solve problems! It is kind of funny to me that my last blogpost was all about calmness, mindfulness, being present...and this writing was followed by some of the most hectic, jam-packed teaching days that I have had in awhile. Ironic? Or did I feel it in my bones? That post was "the calm before the storm." The ten days before Thanksgiving break were absolutely wild for me...too much to do, get done, make happen. Now it is a Thanksgiving weekend, and I am thankful to immerse myself in writing again. Writing is a real priority for me - and yet I haven't written a blog post in two and a half weeks. How does that happen? 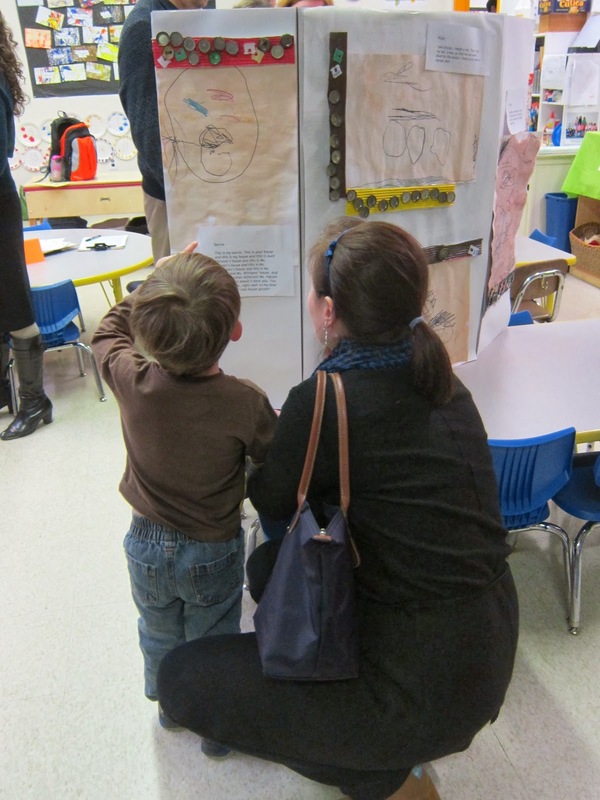 Our first trimester was coming to an end and we had our evening "Learning Showcase," where all the students come back to school with their families, to see and learn about everything we've been doing for the first many weeks of school. A lot of prep goes into this event...making sure that every student has their work represented in the classroom, creating both wall and table displays, writing the documentation of the children's learning. 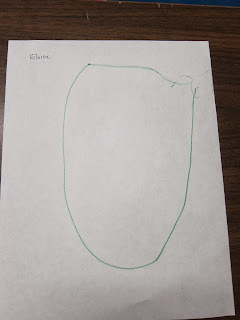 [I shared the children's beautiful found object artwork, their special stories, plus their self-portraits.] It is a big, exciting event - especially for preschoolers. Imagine - coming to school two times in a day! Coming to the classroom with family! Coming to the classroom when it is dark outside! 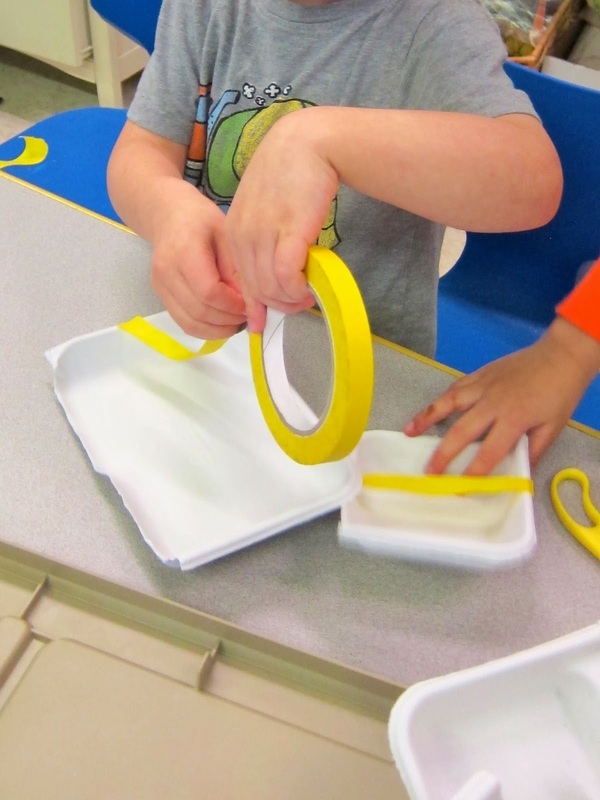 The preschoolers were beside themselves with excitement, both in anticipation of the event and in the classroom that evening, during the event. I looked around the room and saw so many beaming faces...such a full room...so many children, so many adults. Everyone lingering, reading the displays, watching the slide show, studying the artwork. We took time for families to re-introduce themselves to one another, connecting as a community. It was a very special evening. A lot of work, but very special. Simultaneously - the same week as our Learning Showcase - the National Association for the Education of Young Children (NAEYC) conference was in D.C. About once every four or five years, this conference is here, in my hometown. It is an extraordinary conference, a "must do" for early childhood educators - four days of non-stop workshops and training sessions on every imaginable early childhood topic - guidance and discipline, curriculum, advocacy, special education, on and on. I "devour" this conference, loving to hear the latest research and theories about teaching, loving to see and hear the strong, inspirational voices of early childhood. But, this year, NAEYC was a very different experience for me. This was my first time attending NAEYC as part of an elementary school. In previous years, I was working at an early childhood center, where the school calendar respects these days as days off for all staff. (There was one year when my Director flew all of us to Chicago to attend the conference, that's how essential this conference was considered to be!) Now, I'm at a preschool that is part of an elementary school, and school wasn't closed. Six of us (preschool through kindergarten, master teachers) were given the privilege of attending this conference. There was insufficient coverage of substitutes, making it impossible for all six of us to be at every day of the conference. Here I was, only two metro stops away from the conference but unable to spend every minute there. Instead, I spent the four days stretched between school and conference, juggling plans for subs, readying for the Learning Showcase, reading the conference program and highlighting the "must sees," searching for windows of opportunity to slip out, rushing out during nap times, starting my day with teaching, racing to the conference in the afternoon. Yes, it was a little nutty, to say the least. This year, for me, NAEYC was a bizarre combination of utter exhaustion and delightful motivation. Of course, Learning Showcase and NAEYC were not the only two priorities of the past many days of teaching. Report Cards were also due at this time. If there's a Learning Showcase, then, the trimester must be ending...and trimester means writing each child's report. So, in and around my teaching, in and around the Learning Showcase, in and around the NAEYC Conference, I had to think about report cards. At preschool, these are anecdotal. There are no grades to offer or test results to share...we write brief synopses of how the child is doing in our school, highlighting our four "I's" - Intellect, Imagination, Inquiry, and Integrity. Three years into our school, our format for these reports continues to change - we were told to write one paragraph, only four or five sentences long; this past Monday, there was a revision to this edict - "one paragraph for each student, approximately 200 words long," due the next day, by end of the day. Oh my, back to writing, Maureen! 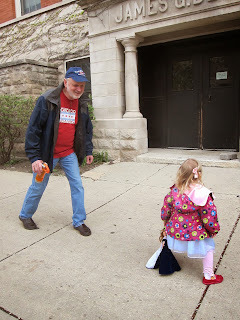 (But, forget about writing a Tuesday Slice of Life blogpost!) Write, write, write. Share about each child's social-emotional, literacy, math, and cognitive learning, share what I see them working on, share what I see them engaged by...share what I love about each of these sweet preschoolers. Families will receive the report card in time for our December family conference; these paragraphs will set the stage for our discussion together. It is a lot of work to create these individual reports, but hopefully very meaningful for families. Let's not forget my teaching . . . This past Monday and Tuesday, throughout the whole school we celebrated "Changemaker Days" - two days of service learning, where we work with the students to identify problems they'd like to solve and then to work on creating positive change. What an interesting concept for preschoolers to grapple with . . .
"you have to stop playing and do something else, like go on a walk"
"when you change to rainboots because it is raining outside"
"when you change your pants in the bathroom"
They definitely had great examples of what change means. How might we change things for the better? What can we do that helps other people? How might we help one another in the classroom? What helps our school? Out came a torrent of ideas. "you have to be nice"
"you do not hit your friend"
"put paper towels in the trash can in the bathroom"
"firefighters - because they help people"
Yes, they were getting to the essence of being a changemaker...preschool perspective. I was impressed. My intention during our centers time was to get the preschoolers cleaning - wiping down the railings of the school stairs, scrubbing tables with shaving cream, taking care of our school. We also planned a fun process art activity...my Teaching Assistant, Ms. Casstevens, is visiting a teacher friend in Nepal over winter break; the preschoolers began work on a beautiful painted mural for her to take to this classroom. 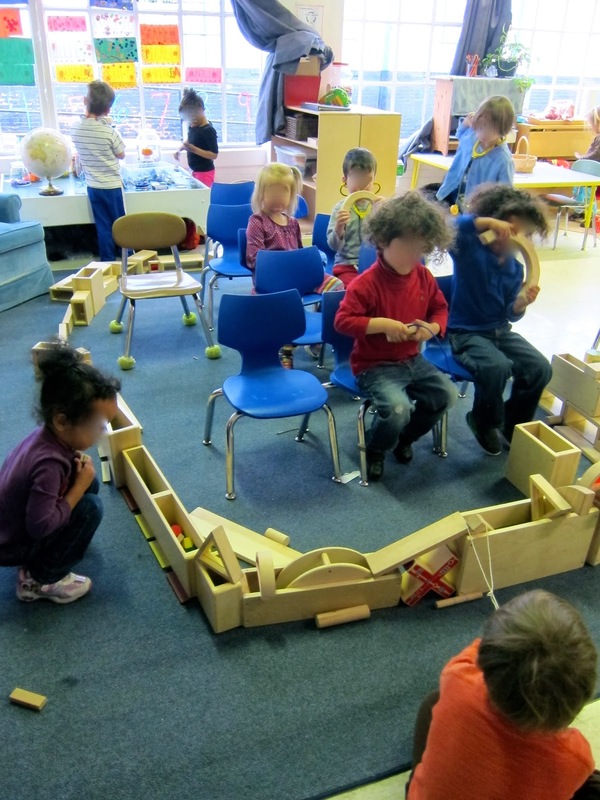 We also decided spontaneously to build a firetruck in the block corner - what better way to practice being a changemaker? 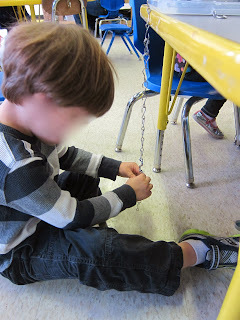 We used every block in the classroom, plus several of our chairs. 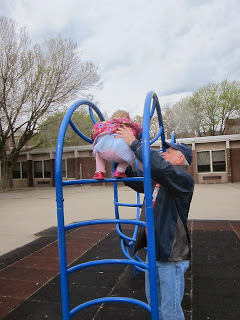 We pretended to have many emergencies - sitting in the firetruck, sounding the pretend alarm, driving quickly to the emergency, spraying pretend hoses on the fire, returning to the firehouse, and then rushing to the next emergency... over and over. It was clear to me that the children wanted to be with me, close at hand - the crazed demands of the past many days had taken me from them mentally, if not physically. When I was in the room, I was preoccupied with "What conference panel is next and can I make it?" or "Did I print out the stories for the Learning Showcase?" or "I must remember to write about that on [John's] report card." Yes, it was time to be present, to play with the children. I gave myself permission to do so. It is what I had to do! Tuesday SOL When are we present? ...coloring haphazardly on paper, over and over, the same color, the same stroke. When do adults ever do this with children? It seems all too rare. She was dressed as a princess. my husband and I froze mid-step. until the next command of "Freeze." busy, full days of time management. What of the child who must adhere to these incessant demands, schedules, expectations? if this is all he/she ever experiences? How can we change our lives so that following the child's lead becomes less rare? Mindfulness...allowing ourselves to be present. Tuesday SOL Do you see what I see? of the joy of play. I placed a basket of safety goggles in the science corner recently, with no particular goal in mind - simply because I had them. The children were delighted! 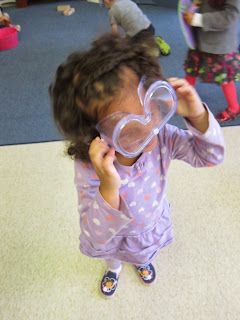 Although we had many "real" activities planned, all they wanted to do was wear those goggles and create their own special fun. Everything is more fun with safety goggles on. Safety goggles are essential for most table top activities! Here, a loud, rambunctious game of underwater shark is improvised! Who knew that safety goggles were a dramatic play prop? You see the world differently through safety goggles. I'm thankful for children who remind me of this, each and every day. Tuesday SOL What about imagination? 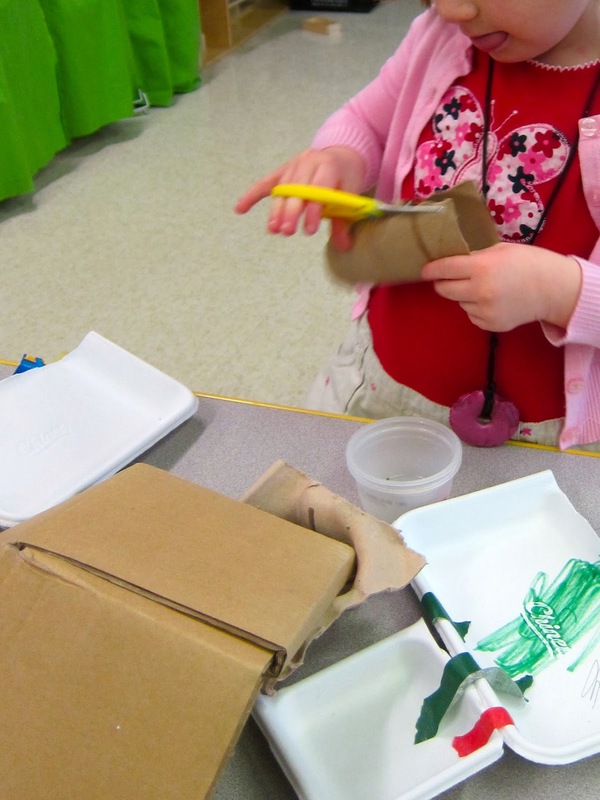 I am fascinated by what makes children think "outside the box." What makes them imagine? For me, working with found objects and recyclables are often the catalyst...an inexpensive and fun way for them to unleash their wonder. We've been delighted by these in recent weeks. Everyone collected 10 or so small, inconsequential, extra items from their homes. At morning gathering, everyone dumped out their objects and we studied them. We discussed what we saw. 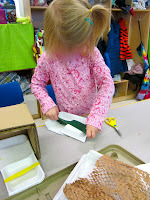 The children were very interested in all the different materials, textures, purposes. 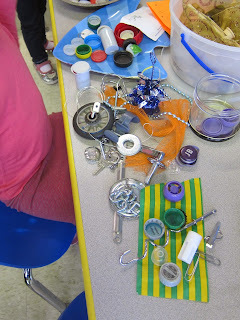 With these materials in hand, the children began discussing the purposes of objects, how things work, what they might be used for, what was similar about our items, what was different...and, also, imagining new uses for things. After gathering, I moved to a table and worked with a small group - six students at a time - continuing our exploration of found objects, but allowing the children to be more focused in their observations. We had set out the found objects on trays and the children took whatever they wanted, exploring these in the smaller space at the table. 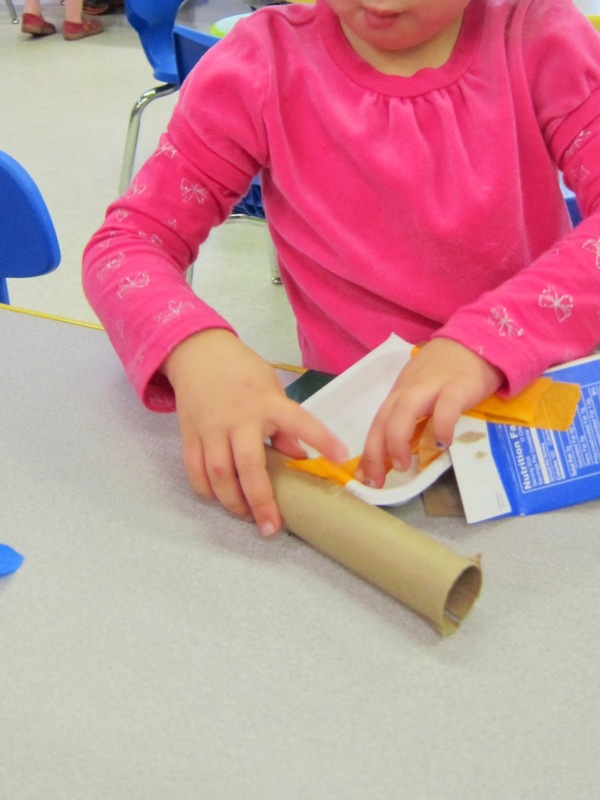 I saw lots of "logic" - children creating categories of objects, sets, lines of materials...often putting “like” items together. One little girl was fascinated by keys, searching through the trays for all the keys. one child delved into the pile of objects and seemed to select items simply by touch or feeling; "I love this pom pom!" she told me. "The dragonfly takes off and look what happens - he flies! Hold onto the rope, ready! 1, 2, 3, 4, 5...I need the butterfly because it saves the bad guys...it doesn't live in this town." Another..."I'm making an enchanted forest." And another had endless imaginative ideas, unable to settle - "I building a ship's tower, no a castle tower. No, I'm making a fish design. Now it is a trap!" one other, putting objects inside one another, as if to create a container. Certainly, some children had only a fleeting interest in the objects - landing momentarily at the table, then running to the dress-ups or elsewhere for a bit (but they often returned to inspect the materials again). Over the next several days, we spent some time dividing the found objects by color, in a variety of clear glass and plastic containers. We created jars of red, yellow, blue, green, gold/brown, silver/gray, purple, black and white materials. So much fun! Last week, I read the story Regards to the Man in the Moon by Ezra Jack Keats. Here, Louis is being ridiculed by peers because his father runs a junkyard...his Dad insists that it isn't junk - all one needs is imagination...and the next thing you know, Louis and pals create spaceships and head to the moon. 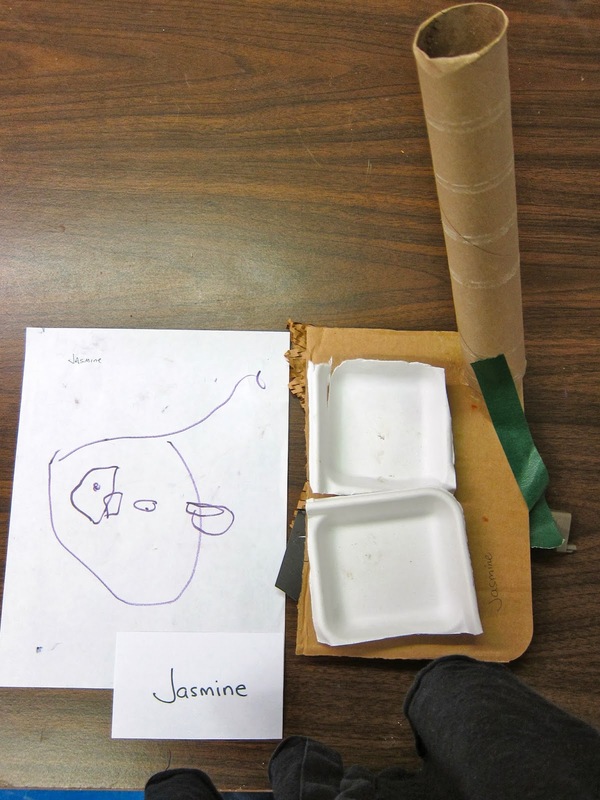 My challenge to my preschoolers - can you build a toy or something fun out of our recyclables and found objects? Then, they blasted off! "I need to make something!!" Look - I found a blue thing...I know where it goes! I’m trying to hook this. What is this? I don’t know what it is! I don’t think they use this anymore. 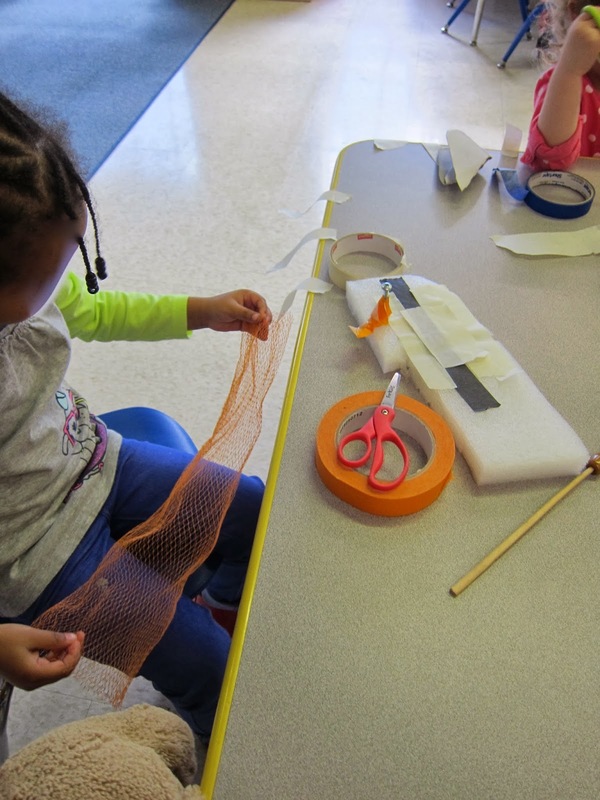 Ms. Ingram, I’m making a little helicopter...I’m making a helicopter cable that hangs down. I’m making a parade – see! This is bendy, bendy, bendy. How to get this thing out of here? Hey, I got these apart. La, la, la, squish, squish, squish. This is hard – listen [taps it on side of containers]. 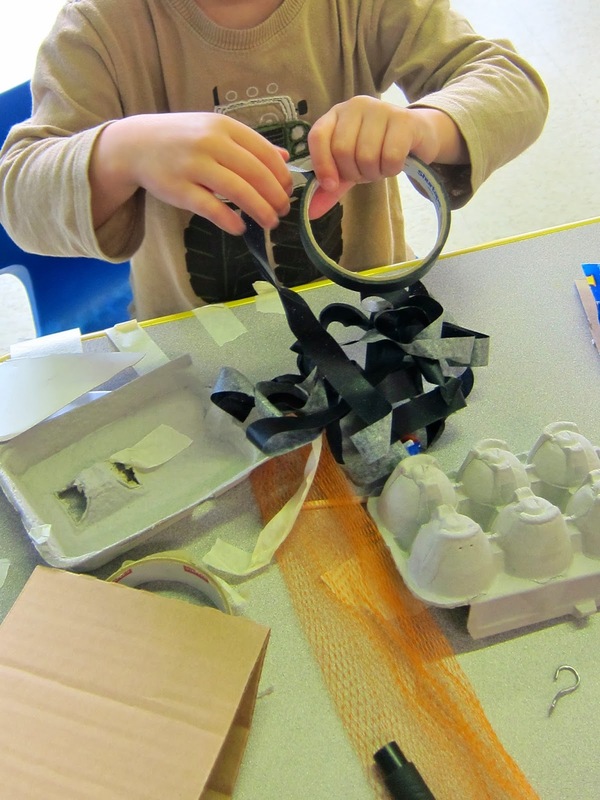 Hoping to instigate on-going exploration with these materials, I expanded our science area to include the found objects and simple recyclables, plus tape. My hope is for the children to dare to touch, explore, consider, create. Thus far, the children are mesmerized. We are having fun with our imaginations!